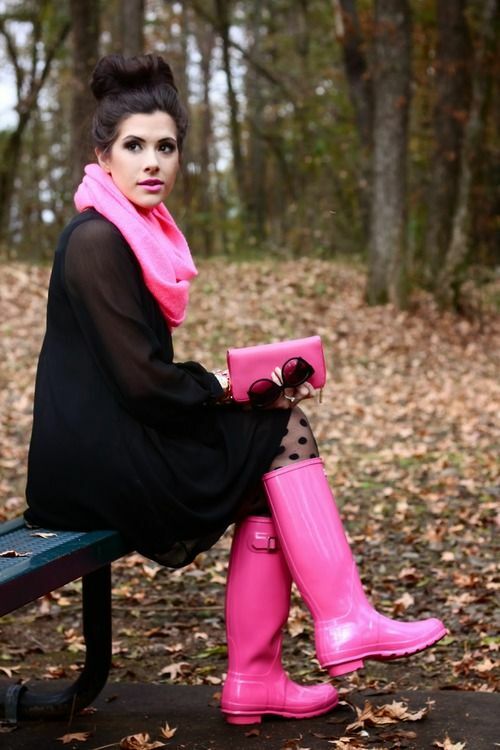 If you are okay with wearing gumboots, then you are ready to rock the party! This kind of footwear is in trend right now, as you can choose various colors (including bright yellow and pink) and prints to make it fun and sweet. 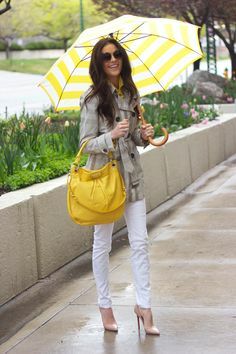 Indeed, your rainy day outfit can be created by wearing those cool boots, bright umbrella and stylish leather cover-ups or coats. Anyway, it's better if we check out this compilation before deciding what and how to combine. 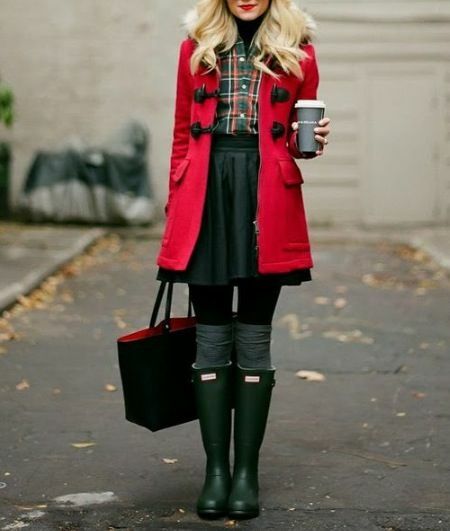 Rainproof slim-fit black coat looks terrific with ruffled white blouse, khaki green high-waisted A-line skirt and black opaque tights. 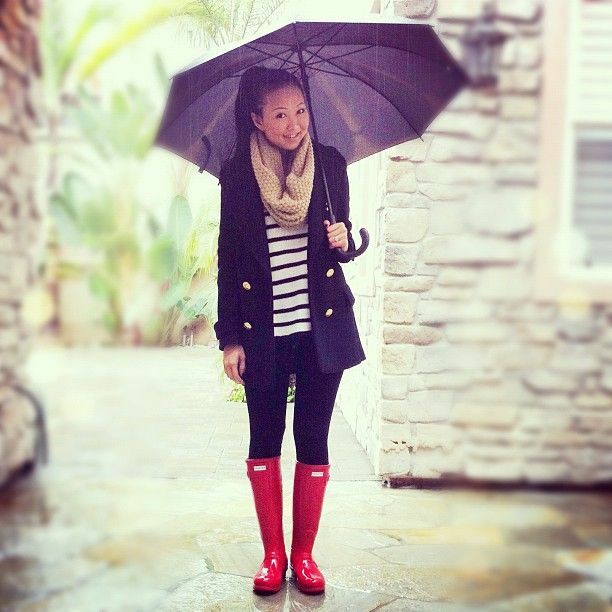 Add a black umbrella to finish the look. Keep it edgy with a shortened black leather jacket, black lace mini dress and rubber boots. When you still don't know will it rain or not, then you better go for this casual outfit that consists of a chambray shirt tied at the waist, black mini pleated skirt and cool black rubber boots. Go classy with a beige trench, black suede boots and a statement black umbrella. You can always make it fun and cool with fuchsia umbrella, bright red hooded coat, grey separates (top and skirt), rich blue leather handbag and patent burgundy boots. I would never wear this kind of suit when it's a heavy rain outside. 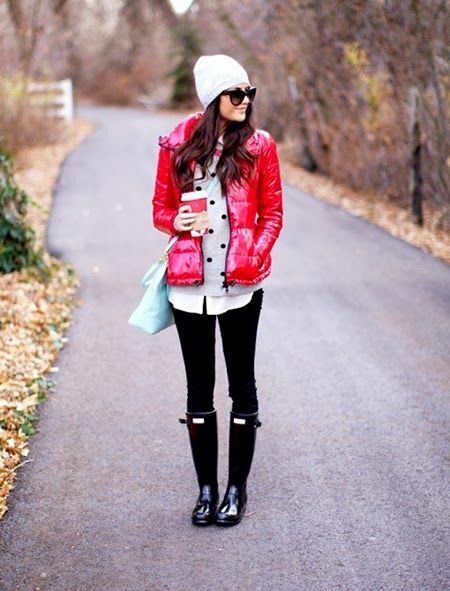 Go urban and try on this glossy red downcoat styled with knitted cardigan, black skinnies, patent rainboots, knitted beanie and cool shades. The Asia inspired umbrella looks fantastic with pale pink coat and floral slim-fit dress. Well, it might be my favorite look so far: pale blue pea-coat, monochrome striped dress, bright yellow boots and long knitted socks.